When it comes to the subject of martial arts movies there isn’t a sane human being alive that would argue that Bruce Lee was The King. But if there is such a thing as The Prince of Martial Arts movies then that title certainly has to go to Jim Kelly. Playing up the novelty of a black master of karate ensured that African-American audiences in the 1970’s, hungry to see black heroes up on the screen would pack the theaters. And they did. I and my friends must have went to see BLACK BELT JONES at least half a dozen times during its original theatrical run and we weren’t the only ones. Whenever the subject of blaxploitation comes up and I’m asked to recommend titles, BLACK BELT JONES is always one of the first movies I mention. The non-stop action, the humor, the wonderfully 70’s fashions and dialog and of course the charm of Jim Kelly as well as his co-star Gloria Hendry makes this essential to any blaxploitation collection. Mafia Don Steffano (Andre Philippe) gets word that the city is going to build a glitzy new civic center and he buys up all the land on the proposed site. There’s one more piece of property he needs; The Blackbyrd Karate School owned by Pop Byrd (Scatman Crothers) who won’t sell. Local drug dealer Pinky (Malik Carter) is in The Mob’s pocket and is engaged to force Pop Byrd to sell. Pop Byrd owes Pinky some money and Pinky inflates the debt, offering a deal for Pop Byrd to pay off the I.O.U. with the karate school. Pop Byrd is accidentally killed by Pinky’s henchmen during negotiations. Enter Black Belt Jones (Jim Kelly) a former student of Pop Byrd’s who now works for an unnamed government agency but is hinted to be The CIA. Along with Pop’s beautiful and dangerous daughter Sydney (Gloria Hendry) who is as adept in karate as Jones himself, Black Belt Jones goes after not only Pinky’s gang but Don Steffano himself to avenge Pop Byrd’s death and save the karate school. 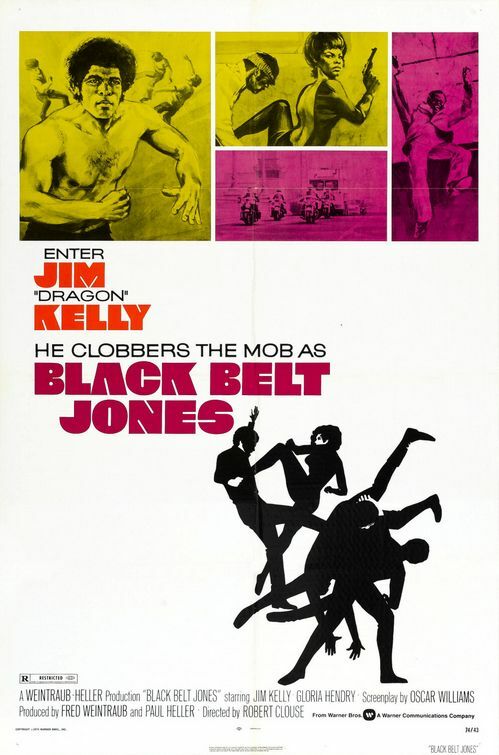 For movies like this, you don’t need much of a plot to get things going and one of the strengths of BLACK BELT JONES is that it takes such a simple plot but due to the energy of the actors, the fight scenes, the characters and the splicing together of the blaxplotation and martial arts genres it makes it so much fun to watch. Jim Kelly himself would never claim to be all that as an actor but he had so much swagger, cool and charm that it more than made up for any lack of acting talent. And there never was a cat who could pull off wearing an afro that big and not have it look ridiculous on screen. There’s also some very recognizable faces such as Marla Gibbs from “The Jeffersons” and “227.” Ted Lange from “The Love Boat” and Eric Laneuville who seemingly was in just about every movie and guest-starred on every TV show of the 70’s. His name is not one most people recognize but his face is. After a successful acting career he has since gone on to be one of the most talented directors working in television with multiple episodes of dramas such as “Quantum Leap” “Monk” “Lost” and “Everybody Hates Chris” to his credit. 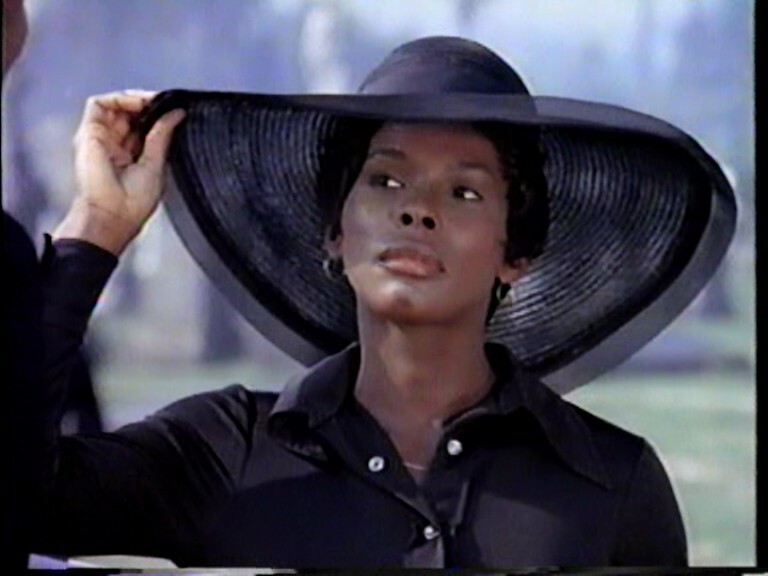 And then there’s Gloria Hendry. Most people remember her as Rosie Carver in “Live And Let Die” but for me BLACK BELT JONES is the role I always think of first when her name is mentioned. I have no idea if she actually was involved in martial arts back then but she sure looks as if she was in this movie. She’s got two terrific fights scenes: the poolroom brawl in which she wallops the piss outta half a dozen of Pinky’s toughs, all of them twice her size and the most famous fight scene in BLACK BELT JONES where she and Jones take on a hoard of enemies at a car wash, battling them in a sea of soap bubbles. It doesn’t hurt that during the fight the only thing Miss Hendry is wearing is a denim shirt that barely covers up her other assets. What else? Oh, yeah…the absolutely kickass theme song performed by Dennis Coffey. It’s a legendary theme song and rightly so, played over the opening credits while Jones has his first fight scene in a parking lot. It’s a fight scene that has sound effects you just don’t hear anymore. When Jones hits these guys it sounds like somebody whacking a leather couch with a tennis racket. So should you see BLACK BELT JONES? Yes. Yes. A thousand times YES. Jim Kelly got robbed in “Enter The Dragon” when his character got killed off (they shoulda killed off that stiff John Saxon instead) but Robert Clouse and Fred Weintraub, knowing what they had, more than made up for it by giving him such a fun and exciting star vehicle. BLACK BELT JONES is nothing but fun from start to finish. For those of you Politically Correct People please be advised that there are racial and sexual stereotypes galore and there is frequent use of the N Word. But if you can accept that the movie was made in a less enlightened period and go with it as such, you’ll have a great time watching it. If you want to see BLACK BELT JONES as well as three other blaxplotation movies of that era: the sequel to BLACK BELT JONES: “Hot Potato” “Three The Hard Way” which has Jim Kelly team up with Jim Brown and Fred Williamson and “Black Samson” next time you hit Target see if you can find the Warner Brothers 4 Film Favorites: Urban Action Collection. I got my copy a few years and paid $9.99 for it. I’m fairly certain you can get it for five bucks now. Even though “Hot Potato” is a big disappointment, the collection is still worth your money. Enjoy. 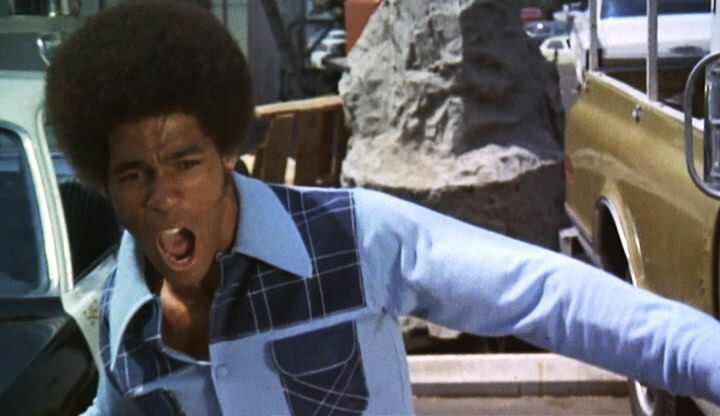 Since I first saw it as a kid in the 70s, Black Belt Jones has been one of my favorite movies. Do you know why Jim Kelly was badass in this? He had a team of hot chicks that hung out in his backyard, jumping on a trampoline until he needed them for missions. It’s been my goal in life to have that. I know! They never explain who those chicks are or why they apparently spend all day bouncing on the trampoline in Jones’ backyard. Just another reason why I love movies of that period.